This typical Italian dish is really easy to make. 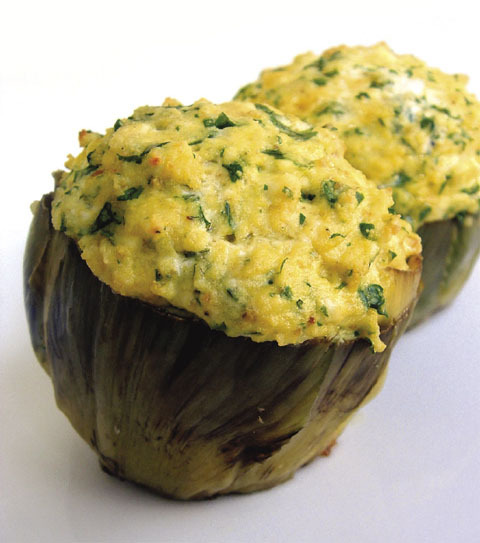 The filling is open to different versions and innovation, but the traditional one is the following: you can stuff the artichokes with ham, salami, egg, Parmesan or Pecorino Romano, slices of bread melted in milk. In the Naples' version, one of the ingredients are the anchovies. Enjoy anyway! In a bowl put the water and the lemon juice. Wash the artichokes, cut the stem to be used again in the filling, the tips of the remaining leaves, and remove the outer leaves at the base. The centre of the artchokes needs to be open in the middle. Then place them in the bowl with water and lemon. Place the loaf with the milk in a dish and let it soak. Cut in smaller pieces the stems of artichokes, chop garlic and parsley, put it in a bowl. Add the loaf, the egg, the stems' pieces, the Parmesan, salt and pepper. Fill the artichokes' open heart. Place the stuffed artichokes in a pan with oil and some water. Cook on a low flame for about 30 minutes. This entry was posted on Tuesday, September 24th, 2013 at 9:26 pm	and is filed under Italian Recipes and Food. You can follow any responses to this entry through the RSS 2.0 feed. You can leave a response, or trackback from your own site.